"A simple but tasty twist to regular old Asparagus." Melt the butter or margarine in a large skillet over medium-high heat. Add the garlic and asparagus spears; cover and cook for 10 minutes, stirring occasionally, or until asparagus is tender. If you like your asparagus well done, reduce heat and cook an additional 10 minutes. 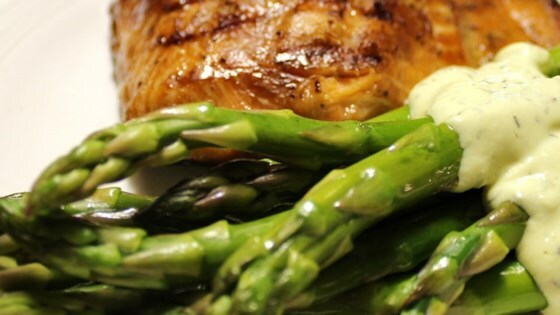 This simple method really highlights the flavor of the asparagus. I use olive oil in lieu of butter/margarine and, to make it a little quicker/easier, I use garlic from a jar and a dash of sea salt to really bring out the flavor! One of my favs. Used olive oil instead of butter. Chopped asparagus into bite-sized pieces and added a handful of shrimp to the mix. Served with pasta. Quick. Easy. Delicious. This is how I fix green beans. It never occurred to me to try it with asparagus. Thank you. This was outstanding.